Here is where I will give you my programs. I don't have that many yet, as I am still learning a lot about programming. Be patient with me. Email me with any problems with the programs (email in Contact Me page). 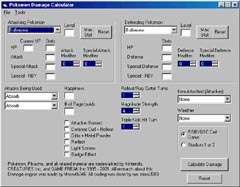 This is the main form of my new program, PokeCalc. It does the major amount of computing for the entire program. All you do is enter your Pokemon and the enemy Pokemon, optionally the stats of the two (or let the program do it for you with the DV and Stat Exp entered). Again, as a third option, you could just hit the Max Stat button and the program will calculate the Pokemon's stats at level 100 with Max DVs and Stat Exp, which is perfect for the GS Bot, or most any other PBS. It also calculates Type Effectiveness automatically, as well as STAB, Physical or Special attack, move Base Power, Item Effects [including Pika and Wak items], Weather modifiers, and basically any other effect you could possibly consider happening. The result of hitting the Calculate Damage button reveals a window that tells the minimum, average, and maximum damage for RBY regular, Critical Hit, GSC regular, and Critical Hit (12 different damage numbers) along with the percentage of damage done to the defending Pokemon, which is a required entry for Damage Calculation. One note about the engine, it will calculate the Stat reset of Wak only if the RBGYGSC Cartridge option is selected. The Stadium Cart option does not use the reset function, as it does not happen the the Stadium. Finally, special moves, like Present, Hidden Power, Rage, and other moves, are also calculated based off of their actual values, like Present and the types, Hidden Power and the DVs, and Rage and the Rage turns. If you have any questions (how would you not? ), either email me and ask, or look at the soon to be included read me file. 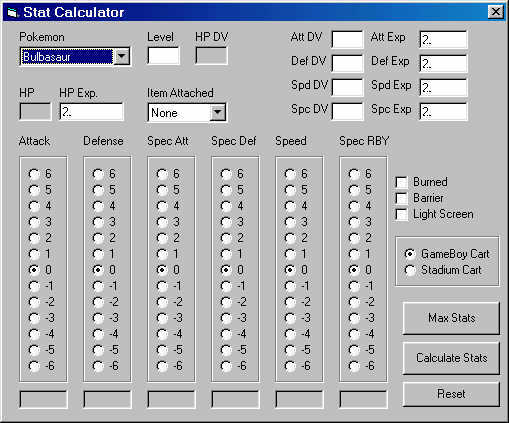 05/27/02 - One of my small changes made to the program above is the removal of the Stat Calculator from the Tools menu. I figured that if anyone wanted to use the Stat Calc, they could just download the Stat Calc Program separately. I plan on eventually phasing out all of the Tools except for the ones that deal with Damage Calculation. All of the remaining tools will be compiled into separate programs. 07/22/02 - Only minor updates this time. I increased the functionallity of the list boxes, which now work better. Also, not auto selection of Pokemon or moves anymore. Also, if you leave the second attack blank, only the first attack will be figured. One last thing, I took out the Hidden Power calc, as it's function is now served in the StatCalc. If you want to know about the program without downloading and installing, just get the readme to get a general idea of how it works. To download the read me, right click the link and choose save as. To view real quick, just click on it. Here are some more Pictures of the other tools of my Program. I'll let you view them and see how they will work. When I start to put the separate tools up here, I'll explain the tools a lot better on all of them. Have fun! This is my first tool to have a program made from it. Basically, it works like a fancy wild or maximum stat calculator. To get the stats of a Pokemon in the wild, leave the Stat Exp. fields with a 2 in them, enter the Level and approximate DVs of the Pokemon and there it is. Max Stats is even easier. Select you Pokemon and hit the Max Stats button. One special feature of this tool it the ability to calculate stats after using stat modifiers like Swords Dance and Curse. Just be sure to go up or down 2 ratings for the moves that modify stats greatly and the other stat modifiers only 1 rating. 05/27/02 - I upgraded the Stat Calculate Program slightly. Now, if you enter a Level and then hit Max Stats, it will keep that Level Value and show you the results for that Level instead of the value being replaced by 100. This is also implemented in every other text box that a value can be entered into. I also added the Option menu with features similar to the DV Calc's features. These include the Simple and Complex Options as well as the Wild and Fully Trained Options. 07/22/02 - Ok, this time, a major update. I totally rearranged the Program interface and got rid of all of those Option Buttons. This looks nicer and is more compact (not to mention smaller on the downloading). I also added a Gender calc and Hidden Power calc into the Program. Both power and type are shown in that one box. I think you will be suprised if you try out Unown in figuring his stats. This is my brand new program, made to replace the old feature of the PokeCalc form. This program is special. It doesn't just tell you which DV's might be right for the stat entered, it also allows you to either use a radio button for Wild and Fully Trained Pokemon, or you can be very specific and choose to use the Effort Points menu option. This should prove very helpful to most people trying to breed for those perfect Pokemon to crush everyone else. Hope everyone finds this useful. 05/27/02 - The update for this program may not seem like much, but it took me a while to think out the coding needed. To aid people in the search for lower level Pokemon's DV's, I added the Recalculate feature to the Options menu. When this feature is on, it allows you to check a low level Pokemon's DV's progressively. Basically, first enter the level and Stats for a Pokemon and then hit Calculate DV. Go to Options and click Recalculate. Now when you hit the Recalculate DV button (the Calculate DV button's text changes), instead of wiping the previous results and printing brand new ones, it simply amends the current listing. This is helpful in finding a freshly hatched Pokemon's DV's with Rare Candies. At every level below 50 for the same Pokemon, there are different sets of DV's a stat could be, like at level 5, a Squirtle's Attack stat might be listed as 1-7, while at level 6 (raised via Rare Candy), Squirtle's Attack DV might be listed as 5-9. Now, obviously, the DV did not change in between levels, so it can only really be 5-7. The recalculate option can do this sort checking for you, making the job even easier. 07/22/02 - Minute update. Only made it not auto select Bulbasaur. Now, it is just blank. That is all.